To understand this, I mentally put myself on a quiet lake in a rowboat and looked up – I saw the shore from which I had come, and I imagined the yet-uncrossed waters behind me, and the analogy made sense. The past is what I see with my eyes in “front” of me, and the future is the uncharted territory “behind” me. Shoot, because I’m a regret person. Someone who stares at the past, hoping it will turn out differently this time. Some people are anxiety people (they fear the future) and some people are regret people like me (we fear the past). Being a regret person makes getting older a peculiar kind of nasty. The more stuff there is in the past, the bigger the potential landscape of regret gets. My landscape is about to get really big, really fast. Our youngest son leaves for college in August, but first he leaves for South Africa in June. That means I am less than three months away from the big, the bad, the scary, the ugly, the regret-goes-big empty nest season. Our neighborhood is quite ordinary. There are 60’s era homes with carports. There are scraggly azalea bushes. There are overgrown wisteria weeds and random Lenten roses. There are trees whose roots upend driveways and whose shade is way too wide these days. The street where I walk the dog is an aging and haphazard overlay on a once-upon-a-time orderly line of tidy homes – and dreams. But today, stretched out in front of me on that street I saw a vibrant explosion of beauty. Everywhere I looked, the sun illuminated color and foliage and life. The road ahead was nearly humming with the spectacular glory of life covering mess and beauty eclipsing chaos that spring always offers. All of the sudden, the Jewish “rowboat with the past out in front” analogy came back to me and I envisioned it differently. The past will yawn wide in my vision, tempting me toward cycles of regret. The messy parts that are beyond repair will show up and show out as I stare at the past that grows in my field of vision. The past will also bloom. It will bloom into life. The past will yield beauty in the people I’ve loved, however imperfectly or however suffocatingly I’ve offered my love. The beauty may look good on the chaos. It might even add charm to the mess. It will lend a soft overlay of glory to the hard edges of unfinished parenting work. The “I wishes” and the “I should haves” and the “if only I could haves” that populate the past in front of me. They will be there, but on this glorious spring day, I dare myself to look for the blooming beauty in the past that lies ahead, as well. I think they call that transformation, “redemption.” And so I will breathe deeply, look into the past, and watch for the beauty. We just remodeled our home. It was intense and LOOOONNNGGG and tiring-exciting. Once we moved back in, the crazy hard work was suddenly entirely worth it. Kinda like having a new baby but without the sleepless nights. First, I read with a mercenary eye asking, “Am I engaged in selling stuff I shouldn’t sell?” Hmmm. Dead end question today. Not resonating. I went back to it. The story involves a heated, post-table-turned-over conversation between Jesus and some (self-assured) Jewish leaders where He tells them He will tear down the temple and rebuild it in three days. They incredulously respond that it took 46 YEARS to build the current temple, so NO WAY he can do a reconstruction in three days. I went back to it again. A house of merchandise. That’s a house of exchange. One thing is traded for another. A dove for a penny kind of a thing. Still not getting very far with this question, church-guide-people. I may just have to give this up. I went back for a final time. Here’s where it got interesting for me. Jesus is the temple. And…our bodies are the temple of the Holy Spirit (I Corinthians 6:19). What if my own 46 year old container, the soul-space that is my body, has become a house of merchandise? What if, in the very courts of God inside the temple that is me, I’ve worked for 46 years exchanging stuff? If I give effort, I earn favor. If I feel shame, I earn forgiveness. If I give good works, I earn the option to rest. If I yield to fear, I earn a sense that danger won’t hunt me down. If I parent well, I earn kids that turn out ok. So many earning ifs turn tricks as empty promises in the temple courts of my soul. So many exchanges with high price tags. So much noise – the capitalistic cacophony of a woman doing all she can to finally enter that place of rest, that place of absolution and peace. When the Prince of Peace has already done it. Today, Jesus turned over the tables and said to me, “ENOUGH ALREADY! Peace; be still. You can be done trading stuff because I’ve made one final, true, permanent, holy trade – my life for yours – and I’m done. You’re done. “Daughter – don’t you want the inner sanctum of your soul to be a resonant, open cathedral space rather than a cluttered, crowded trading space? “My child – I have done the work of your forty-six year lifetime. You can take down the tables. You can put away the counting devices. You can sweep out the tables heaped with effort and works and hopes and fears. You can trust my three-day-renovation to be the guardian of your sacred space. May the temple space of your heart be filled with the peace won by the finished work of Jesus on this Lenten day. The 24 hour news cycle has worn us all out, and we’ve gone “back to normal,” letting pundits be pundits and Facebook be the place of innocuous and sweet family photos. Normal is good. It’s good for the blood pressure and the extended family dinners out. It’s good for sleep patterns and long term mental health. I’m not being sarcastic when I say that normal is good. It’s not good for refugees. It’s not good that we normalize unfounded fears. It’s not good that we vilify certain people in large groups in the course of normal conversation. It’s not good that we figure that large-scale human suffering is normal, as long as it’s not in our backyard. It’s not good that we pretend not to hear the disturbing political discourse behind the static that we tell ourselves is normal. There’s a weariness to this journey. No one feels it more, I would imagine, than the refugee who just got caught in the system and may never get back to normal again. Today’s executive order is, perhaps, more legally fortified. It’s perhaps less shocking, with fewer immediate teeth. It probably appeases some businesses and lays to rest some fears that permanent residents have. It’s no less harsh to the least of these – the refugee. Once more, the most vulnerable people group in the immigrant community suffers most because they do not have a voice. This should not be normal, my friends. Not when followers of the God who bestowed dignity by making men and women in the divine image and then sent His beloved to fight on behalf of the broken – every last one of us – look on. Please – let’s make standing with the most vulnerable a non-negotiable. Can we make it normal? This climate of animosity makes me want to hide out – to insist to myself that these issues will sort themselves out and that they are above my pay grade. The rancor saddens me deeply. I write this sitting in my comfy living room with my coffee, enjoying the quiet morning. This is probably what most of my good friends also are doing this fine morning. Most of my good friends are just like me – white, upper class, Christian, and conservative. In my younger days, I interned twice at a conservative think tank and once for my Republican Senator. I must have answered 10,000 phone calls from people voicing their opinions about issues that riled them up. I bet I mailed 5,000 letters that summer…letters back to people saying, “I heard you. Sincerely, – Your Senator.” Most people would have found this paper-cut filled job mundane. Not this girl. I loved every minute of it. All this to say that I love politics; I love issues; I love debate; I love sharing it with others. But this love has a dark side. It can make me want to win, want to one-up, want to prove, want to score. It can make me more about me – me being right, smart, informed, and engaged. It can even make me condescending. So this refugee issue is a tough one for me. It’s tough because I do happen to have a more well-informed perspective than a lot of my friends. Not because I’m better, but because I’m invested where I live, and I live among refugees and the people who care for them day-in, day-out. I want to share my views, but I want to do so from a place of grace and humility. It’s tough because I know enough to care deeply about this issue, but I also know enough to know that I’ve not begun to understand the journey of the refugee. For me to speak for someone whose journey is so much more rich with suffering than mine feels like I’m cheapening the lives of my friends and using them as a platform for my own voice to be heard. That terrifies me. It’s tough because there’s a deep isolation to living in the in-between, and sometimes I don’t know how to talk to either “side.” I have friends – true friends with whom I laugh – who try to support families with minimum wage jobs. I have friends who ran for their lives in the middle of the night. I have friends who wear a head covering and value the religious freedom here. I have friends whose children are unaccounted for…lost. These friends don’t know my other friends. Friends whose kids struggle with anxiety and eating disorders and addictions. Friends who seek to love and neighbor well in their jobs, schools, churches, and communities. And friends who become truly exhausted by the rat race of raising kids in a hyper competitive environment. My sets of friends don’t really know each other. And sometimes I don’t feel like I fully know my own friends – in either part of my world. But yet I want to speak today so that one set of friends sees the other more clearly. I want to simply share what I’ve come to be for – not against. I want to invite anyone at all to come have coffee, hang out, and learn more. We can learn from each other. I know we can. I’m for careful vetting. The fact is that the refugee resettlement process represents a vetting endeavor that takes between one and two years to complete. To come to America as a refugee is the most highly vetted way to come. Already. I’m for nuance. The issue of immigration and refugee resettlement is a nuanced issue. I’m for people being treated carefully, respectfully and with dignity, because no human beings deserve a label that leads to fear that leads to bias that leads to discrimination. The executive order that halts an already very thoughtful program without any care for the vulnerable people “in process” is not nuanced. In my view, it plays up fears and is reactionary, leaving me wondering what is being reacted against in such a strong manner that it stops the flow of all refugees for 120 days. Every single one. Is there a new, giant threat we don’t know about that justifies this? I really would love to know. I am for understanding. I’ve read so many articles this weekend from so many perspectives – some are reactionary, some are cold, some are incendiary, some are downright confusing. It seems that it’s incumbent on us to approach these issues from a place of humility when we take strong stands about them. So much of what’s happened this week in the new administration has been confusing to me. I’m not a trade expert. I’m not a health care expert. I’d have to look deeply at many of the issues to know what I think. But in this new era of “echo chamber politics” where we can conceivably only hear what echoes the views of our tribe, let’s be people who seek to understand and who aren’t afraid to read and digest the other side. I’m for loving the vulnerable, because I believe the gospel, and because I believe that Christ meant it literally when He opened His public ministry by saying, “The Spirit of the Lord is on me, because he has anointed me to proclaim good news to the poor. He has sent me to proclaim freedom for the prisoners and recovery of sight for the blind, to set the oppressed free, to proclaim the year of the Lord’s favor.” (Luke 4:18-19) Jesus acted boldly toward the broken and vulnerable (namely all of us), even when we were His enemies. This is the gospel, and I believe this is His very work in the world through us, His Church. He told us that we could love without fear – not because the world isn’t scary but because love is bigger. I’m for conversation. I’d love to have one with anyone, anytime (well, not after 9 pm because we all know I go to bed early…) Seriously, send me a note and we’ll have coffee. Here are some more articles for those of you who like to learn more (thanks to Judy Wu Dominick for some of these). Great insight into the current immigration pathways to the U.S. as well as more look at biblical frameworks regarding immigration policy. Let your heart take courage. During Advent, the nativity shimmers with images of God Himself breaking into humanity. We behold a feast of peace, hope, faith, and joy – a table from which our heart can lay hold of courage this day. There is a father, intent on divorcing his wife quietly so as not to disgrace her, who instead lays hold of faith and obeys, holding steady in the face of so much dissonance between law and grace. There is a mother, yielding to deep unknown and pondering mystery in her heart, unable to make sense of the raw collision of flesh and heaven happening in her body, yet she yields. She lays him in a holy manger – a heavenly paradox of grime and glory. There are shepherds, doing their job just like every other night, who are surprised by the music of a heavenly choir. Why them? Their souls are party to glorious bounty beyond any pageant or high-end event in Bethlehem that night. They come because heaven’s music is so loud they cannot help but listen. And there is a baby. God. God with us. He came to people, beginning with these few – a confused man of faith, a young woman yielding in the dark, men on the clock who couldn’t resist the loud music. He came to you. Let your heart take courage. He is here. Pause, listen to the angels who cry glory to God and peace to men. Peace to you. Be strong. Let your heart take courage. Take faith, take surrender, take joy. May your journeying heart feast on the bounty of God-with-us. 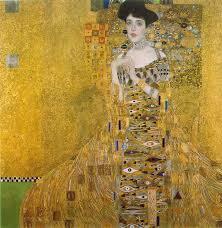 Doug and I saw the movie Woman in Gold last night. It is the true story of an elderly Jewish woman who fights to get a Klimt masterpiece, Adele, rightfully restored to her family. During the Nazi takeover of Austria, her very wealthy family was stripped bare of their treasures, including the painting, which had been a commissioned portrait of her Aunt Adele. Newly married, she and her opera-singer husband fled Austria and immigrated to the United States, leaving her ailing father, stalwart mother, and a treasure trove of family heirlooms behind. All were lost to the Nazis. The woman, Maria, is now a woman’s clothing store-owner in Los Angeles. She resides in a modest bungalow, but her refined tastes now mingle with her intensely focused immigrant work ethic, and, in her 80s, she presents like a perfect lemon icebox cake at a potluck supper…humble, with good posture. Our friends here in Clarkston remind me of Maria. Each was an owner of a trove of family treasures. Their treasure may have been an education, a career, a specialty. Their treasure may have been a family name, a family system, or a connection to the land. Their treasure may have been a treasure like Maria’s – some work of art, tangible and priceless. It may have simply been something priceless to them – a home, a favorite chair, a picture, an heirloom. No matter the treasure, it is lost to the ravenous looting of injustice. Nevertheless, they hold their heads high. Humble, with good posture. Tomorrow night, the Refuge Coffee Co. truck launch party happens. The trainees at the party will be those who have forfeited treasure, but who face the world with dignity and with the knowledge that they are not who they seem. There will be others of us at the party who have also lost treasures along the way. We have forfeited small things privately or large things publicly. Loss is universal. May we learn to walk humbly, with good posture. Join us tomorrow night. We’ll be celebrating from 6-8 pm at 4170 Ponce de Leon. We’d love to see you there!